Several weeks ago I came across and shared this tutorial for taking your original art and using it for wrapping paper, scarves, etc… Since posting it, I've been anxious to try my hand at it. I've been playing around with watercolor lately, its not a medium that I'm that familiar with, but I am enjoying the experimentation. 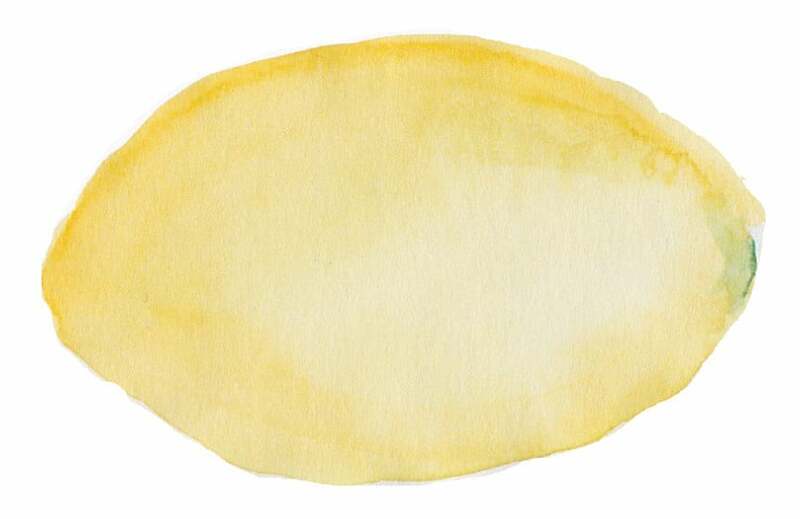 I ‘doodled' this lemon in watercolors, as well as some branches, flowers and a tomato. I was able to successfully scan my lemon and play with it in Photoshop Elements 13, but just the basics. There are some good “how to” Photoshop books on it but I still have a lot of work to do to get up to speed in Photoshop…kinda makes my head hurt! 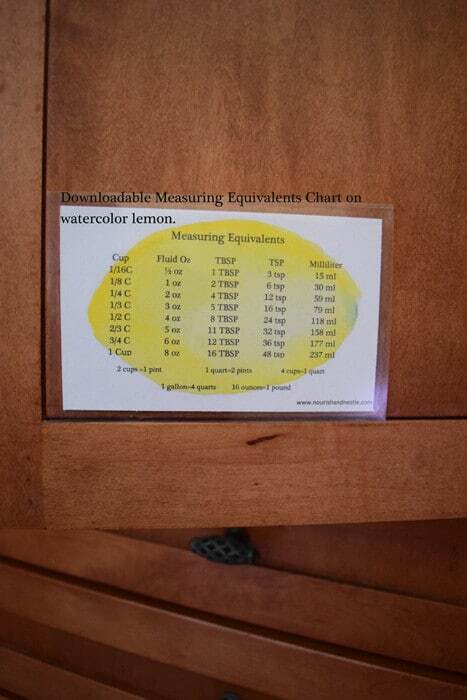 I decided to use my lemon to bling up my existing Measure Equivalents chart I keep taped on the inside of one of my cabinet doors. I refer to these charts several times a week. My brain can only store so much data and the number of teaspoons in a ounce or tablespoons in a 1/2 cup is something it's better for me to outsource to a chart. I had several taped up and they had definitely seen better days so I combined the information on two of them to put on my lemon. 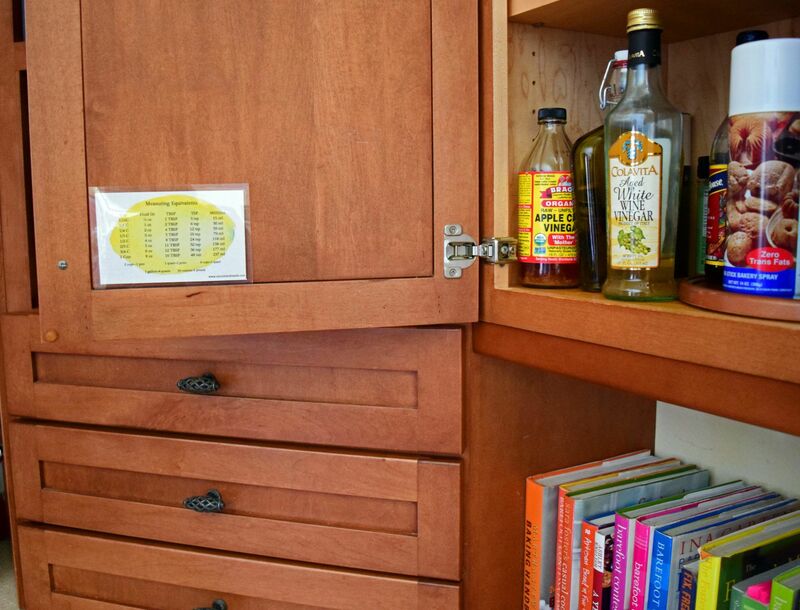 I superimposed the data on top of the lemon, printed it out and laminated it with Scotch Self-Sealing Laminating Pouches. It's just as handy as before, but instead of just a chart on plain paper, my eyes are entertained by the artwork in the background. I have published printable PDFs of several of my most popular knit patterns and printables, including this lemon chart, and have made those available to all of my subscribers. Come back and check every now and again. I will continue to add patterns and printables to this page as we go along. We're very excited about our online shop at Society 6 – much of the artwork that you see on our pages is available for purchase as a print or on a variety of products – from coffee cups to phone cases. Click on the image below, browse around and have a look for some great gift ideas!